As much as I love our kitchen, it lacks practical storage. We have minimal counter space and the tiniest pantry. My goal is always to keep as much as possible off of the countertops, and whatever is left on the counters should be pleasing to the eye. 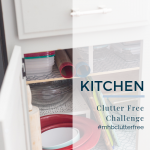 I’m always on the hunt for good, inexpensive, kitchen organization solutions. Not only do I look for functional kitchen organization items, I also want them to be pretty. 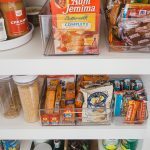 In my quest for optimal kitchen organization, I found some really great items at budget friendly prices and I want to share them with you. Guys, there are loads of awesome organization options for the kitchen at Walmart. Here are some of my favs. Baskets – Hanging baskets are great to put on the inside of cabinets to hide everything from spaces to cleaning supplies. I use baskets and bins like these and these in my pantry to corral like items. 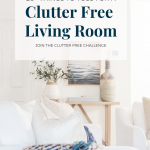 Pro tip – this also makes your pantry look way tidier than it actually is. Trays and Stands – Trays and stands double as decor and function. You can find colorful trays like these or classic cake stands to keep items together. I use trays in the kitchen as a coffee station and to keep all of my cooking items like my knife block, utensils, and cooking oils. Cake stands are so pretty, but they also give height to your kitchen decor. While most items in your kitchen will be directly onto of the counter, it’s nice to have a stand to give a little height so it breaks up the decor. Chalkboard – I have a giant chalkboard like this one in my kitchen (seen here in my summer home tour) and it’s great for keeping my brain organized – like it keeps me sane! I use it to write notes to myself, keep our schedule, and the girls enjoy drawing on it. It’s always a great way to keep them occupied while dinner is cooking. It also keeps the clutter at bay because I don’t have a million notebooks or pieces of paper cluttering up my countertops. 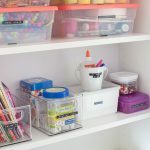 Clear Canisters – I’m a huge fan of clear canisters for pantry organization. I like opening the pantry and seeing exactly what I have and how much is left, ya know? I mean, imagine the wrath of an almost two year old when she wants Cheerios and you open the box only to find Cheerio dust left. That’s happened to you right? Me neither. 😉 These come in multiple sizes and are really reasonably priced. 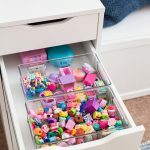 You could add a cute label to each one to take your organizing game to the next level. Crocks – In my dream kitchen, I would have so many drawers I wouldn’t have a need to keep my cooking tools on the counter… one day. For now, I have two crocks that I use and I leave them on the counter near my stove. I love this pair of crocks because they’re classic – the white, textured, ceramic is beautiful. Magnetic Knife Stripe – Behold, more countertop space. You can ditch the knife block and opt for this magnetic stripe to keep your knives neatly in a row. I love this idea and would love to install one of these bad boys in my kitchen. Kitchen Cart – If you are desperate for more counter space, this kitchen cart is one that dreams are made of. It has counter space plus storage. Oh, and it’s fabulous and less than $150! I love the weathered wood look – very on trend yet classic. Small or awkward kitchens require you to get creative, don’t they? I love all of these products from Walmart because of their functional design and great prices. Do you have a total winner in your kitchen that helps it function better? I’d love to hear about it.